Priced: $68.95 - $99.00 Rated: - 4 stars out of 5 by 3 reviews. Spyder Endure Full Zip - Women's: A feminine fit and complimentary design lines have made the Endure a bestselling women’s sweater style in Spyder’s line up. Features a full front center zipper, Mid-Weight Core Sweater material with anti-pilling fleece backing, and concealed zippered hand pockets. Constructed of polyester mid weight sweater knit with anti-pilling fleece backing. A bestselling Spyder sweater style, the Spyder Women's Endure Full Zip Mid Weight Core Sweater has a feminine fit, complimentary design lines, and cozy, fleece-backed mid weight Core sweater material to make it poised for even more popularity. 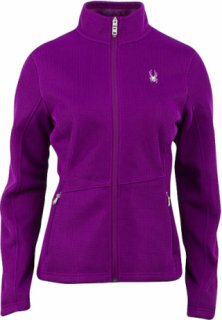 For a feminine fit and complimentary design, the Spyder Women's Endure Full-Zip Midweight Core Sweater is a great choice. Reverse-coil zipper. Concealed zippered hand pockets. 100% polyester with anti-pill fleece backing. Imported. Colors: Black, Flirt, Regal, Splash, White. Part of the Core Sweater Collection, the Endure Full Zip Sweater is one of Spyder's top selling sweaters. Keep your core warm in complete sporty style. A bestselling Spyder sweater style, the Endure's feminine fit, complimentary design lines, and cozy fleece-backed mid weight Core sweater material make it poised for even more popularity. Spyder embroidered logos on the chest. 14 people have already set their own price. This is a great sweater. It is on the sporty side. It is thick, well made and super comfortable. I would highly recommend it. I ordered a size medium and it is perfect. As a point of reference I wear a size small in North Face jackets. Best light jacket! Perfect for layering and super comfortable. I'm 5'8", 145 lbs and got a large. I always need longer sleeves and this probably would've been fine in a medium, but wanted the extra room. I love the tailored look of this sweater/jacket but it has two flaws. It is tight around the chest if you do not size-up (and then the sleeves are really long). I carry a cross-body bag and the material does not hold up to the friction of a strap. I have not had similar problems with my patagonia and north face sweaters so I think it is particular to the spyder material.